A proposed $200 billion tariff on Chinese goods would affect the Apple Watch, AirPods, HomePod, Beats headphones, AirPort routers, Apple Pencil, Magic Mouse and Magic Keyboard, MacBooks, Mac mini, and a selection of cables, chargers, and adapters, Apple said today in a letter sent to the U.S. government. Apple's letter urges the Trump administration not to apply the tariffs that will affect Apple products and to find "other, more effective" solutions instead. According to the company, the U.S. will be the hardest hit by the proposed tariffs, leading to lower U.S. growth and competitiveness and higher prices for U.S. consumers. The proposed tariff list covers a wide range of Apple products and the products used in our U.S. operations: Apple digital health and wireless connectivity products, including Apple Watch, Apple Pencil and Air Pods; Apple computing tools such as MacMini; Apple adapters, cables and chargers engineered for efficiency and safety; Apple-designed components and made-to-specification tooling for Apple’s U.S. manufacturing and product repair facilities; specialty testing equipment for Apple’s U.S. product development labs; and servers, hard drives and cables for Apple’s U.S. data centers that support our global services such as the App Store. According to Apple, the tariffs will increase the cost of its U.S. operations, divert resources, and disadvantage Apple compared to foreign competitors, leading to more expensive Apple products for customers. Second, because all tariffs ultimately show up as a tax on U.S. consumers, they will increase the cost of Apple products that our customers have come to rely on in their daily lives. For example, the proposed tariffs cover Apple Watch, which has become the top-selling smart-watch in the U.S. and globally. Since we introduced Apple Watch a few years ago, we have heard from users about how it has changed, and in some cases saved, their lives. Apple Watch is also being used in conjunction with American universities to help individuals to manage health conditions such as epilepsy and post-heart attack recovery. Apple CEO Tim Cook said in July that Apple was evaluating the fourth tariff the United States plans to implement and would comment on its impact on Apple at a later date, which is what today's letter pertains to. Cook called the examination of the tariff "a tedious process" because of the need to consider not only revenue, but also purchases being made through other companies unrelated to revenue, such as data centers. The United States has already put three sets of tariffs in place affecting steel, aluminum, and $50 billion worth of other goods from China, but none of these tariffs have impacted Apple products and devices. When commenting on tariffs in July, Cook said that while Apple believes the trade agreements the U.S. has with other major economies are in need of modernization, tariffs are not the right approach. 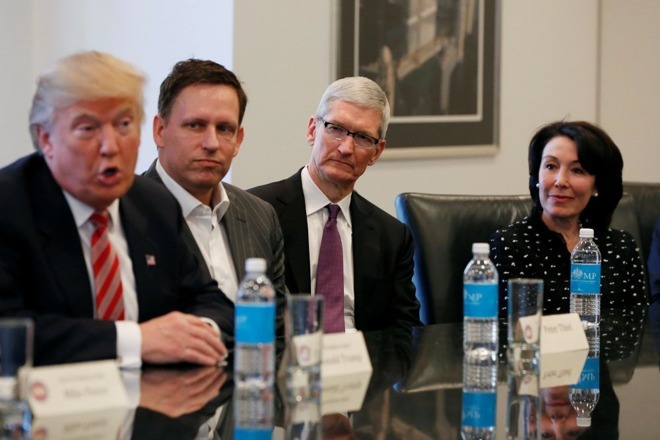 Cook said Apple is, however, "optimistic" the tariff issue will be sorted out, and that the company is hoping "calm heads prevail." Apple shares dropped following the tariff news. I support the POTUS on this issue. And will pay the delta cost without whining. Tim Cook must be really distressed by the thought that Apple will only make $40 per dongle instead of $45. In all seriousness, Apple under Tim Cook will pass this onto the customer so hopefully it is just a negation tool towards a better trade deal. Tariffs may be useful as a negotiating tactic, but long term just foolish. They often just put money in the hands of powerful corporations or lobbies- the best example being sugar. Lets hope they are brief and result in more free trade deals. EVERY company will increase the price of their products relative to the tariff. The only losers are the American people. The idea of a tariff is to increase the price of foreign imported items so that American companies can compete. It works for very similarly priced products, but because manufacturing is so much cheaper in China, the prices are just too far out of whack. For example, if I want to buy an American-made plastic chair, I'll pay $30. The same Chinese-made plastic chair is $5. After the tariff, the Chinese-made plastic chair will be $7. This won't influence any people to buy the American-made version, it will just take $2 out of everyone's pockets. You guys must be tired of winning by now. You mean until he’s re-elected for another 4 years? Nothing burger. "Proposed" = negotiation tool. Let the stock drop and buy in. Anyone else remember when conservatives wanted lower taxes? Now they're paying higher taxes and are happy about it. That's the effect of having a cult leader, I suppose.